Consider New Talavan’s temple as your home away from home. It’s a true oasis in the midst of our often unforgiving modern world. Here, you can freely bathe your soul in the transcendental sound vibrations chanted and sung regularly throughout each and every day of the year, gaze in meditation on our captivatingly beautiful deities, and read through our books, which reveal the deepest mysteries of life as taught by the greatest teachers of Vedic wisdom for thousands of years. Please note we request that you dress modestly in the temple. The Temple was built in 1979, with renovations done in 1987. 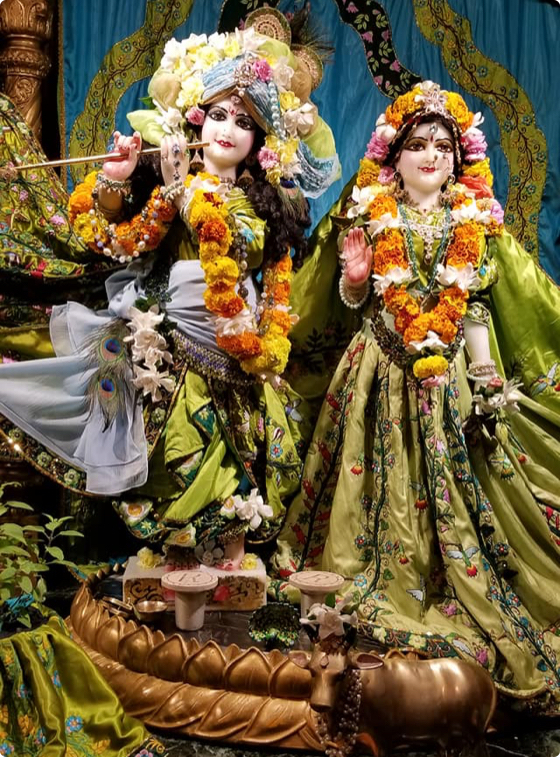 New Talavan’s Temple is presided over by our most merciful, gracious, and beautiful Lordships, Sri Sri Radha-Radhakanta and Sri Sri Gaura-Nitai. The daily deity worship is performed according to the exacting standards outlined in the Vedic scriptures. This worship of the Lord in His deity form (archa vigraha) is a deep and amazing science that must be experienced to be fully appreciated. There is a common misconception that this type of worship is polytheistic. Actually, our teachings are more accurately labeled as polymorphic monotheism – there is one supreme God, but he has many different forms and names. The deities of our temple are different aspects of the one supreme God. For example, Sri Sri Radha-Radhakanta are the Lord’s topmost masculine and feminine forms.